NASHVILLE, Tenn.—Most churchgoing Protestant parents of young adults say their kids grew up to be Christians. But half of them don’t actually practice the Christian faith, their parents say. And the biggest factor predicting their spiritual health as young adults is whether they read the Bible regularly as kids. Those are among the findings of a new study among Protestant churchgoers about parenting and spirituality from Nashville-based LifeWay Research. The study was sponsored by LifeWay Kids for use in the book Nothing Less: Engaging Kids in a Lifetime of Faith. For the study, researchers surveyed 2,000 Protestant and nondenominational churchgoers. All attend services at least once a month and have adult children ages 18 to 30. 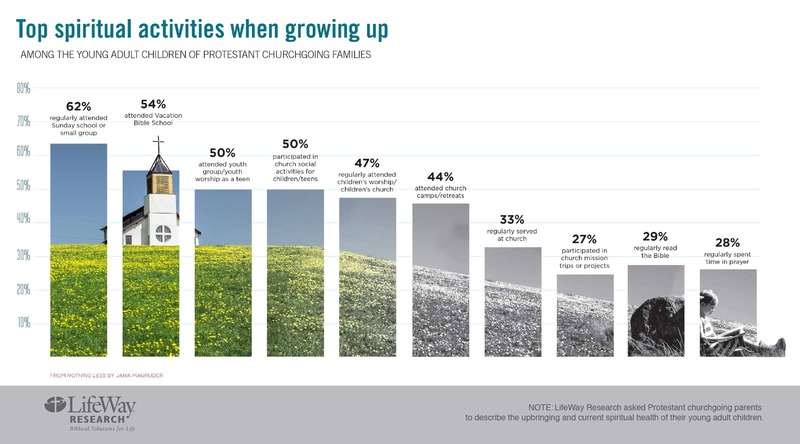 Researchers wanted to know what parenting practices pay off over the long haul when it comes to spiritual health, said Scott McConnell, executive director of LifeWay Research. LifeWay Research took a twofold approach to the study. First, researchers asked parents about 40 factors that could affect a child’s moral and spiritual development. Among them: whether the child’s parents had been divorced, whether the family prayed or ate meals together, what kind of school the child attended, how often the child went to church or youth group, and even what kind of music the child listened to growing up. Shares his or her faith with unbelievers. Supports local or foreign missions. Parents gave observations for a total of 3,472 adult children. Eighty-five percent identify as Christians, according to their parents, giving them at least 1 point on the 8-point spiritual health scale. But only 3 percent had a score of 8, the highest possible. Two-thirds had a score of 2 or less. Half had a score of 0 or 1, meaning they either don’t identify as Christians (11 percent) or they identify as Christians but have none of the other spiritual practices (39 percent). LifeWay Research then compared the results of all these young adults to find out which factors predict the highest spiritual condition. The top factor: Bible reading. Twenty-nine percent of the young adults regularly read the Bible while growing up, according to their parents. On average, that group has 12.5 percent higher spiritual health than otherwise comparable individuals who didn’t, LifeWay Research found. In addition, spiritual health levels are 7.5 percent higher on average for young adults who regularly spent time praying while growing up (28 percent), regularly served in church (33 percent) or listened to primarily Christian music (22 percent) than for comparable individuals who didn’t. And scores average 6.25 percent higher for young adults who participated in a church mission trip while growing up (27 percent) than for comparable individuals who didn’t. Doing all five of these practices in childhood could boost a young adult’s spiritual health score 41 percent, putting the young adult above the 90th percentile, said McConnell. “Practicing your faith—in specific ways—really pays off later in life,” he said. Jana Magruder, director of LifeWay Kids and author of Nothing Less, said it’s easy for parents to be caught up in the busyness of life—and not to ground their kids in the practice of reading the Bible. “The key takeaway from the study is a simple yet profound finding that God’s Word truly is what changes lives,” she said. 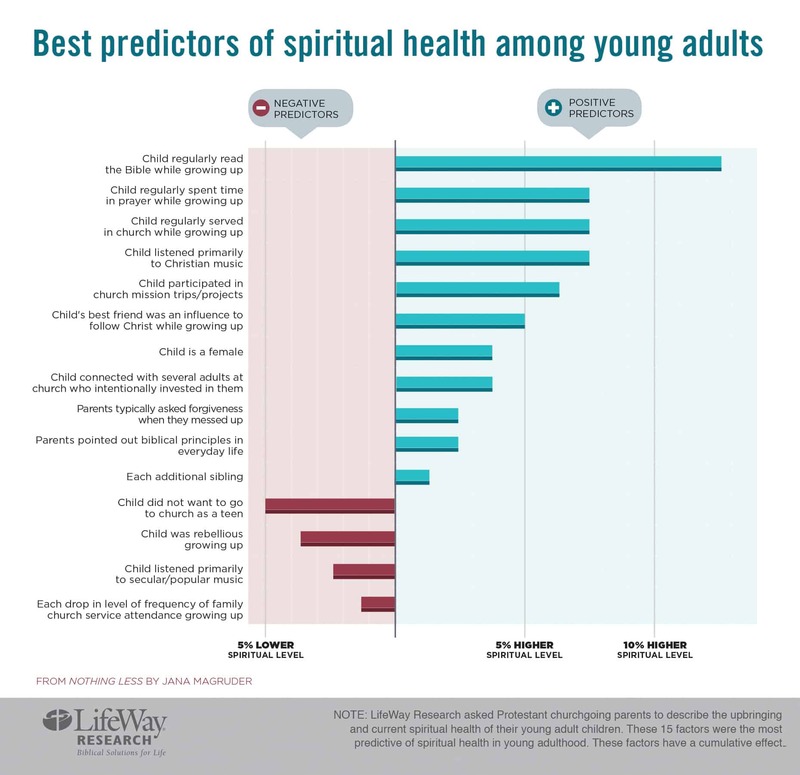 Researchers identified a few factors that point to lower spiritual health for young adults. Those whose parents say they did not want to go to church as teens (22 percent) score 5 percent lower on spiritual health as young adults. Those whose parents say they were rebellious (16 percent) had scores 3.75 percent lower than others, and those who listened primarily to secular music (58 percent) had scores 2.5 percent lower. Attending popular church activities such as youth groups and Vacation Bible School predicts spiritual health for young adults—but only when linked to core practices such as reading the Bible and serving, said McConnell. Other activities, such as family meals, did not show up as key predictors in this study. Reading the Bible several times a week. Taking part in a service project or church mission trip as a family. Sharing their faith with unbelievers. Encouraging teenagers to serve in church. Asking forgiveness when they messed up as parents. Encouraging their children’s unique talents and interests. Attending churches with teaching that emphasized what the Bible says. Teaching their children to tithe. All these little things can pay off, said McConnell, by showing kids what practicing your faith looks like. — Young Bible Readers More Likely to be Faithful Adults, Study Finds originally appeared at LifeWay Research.